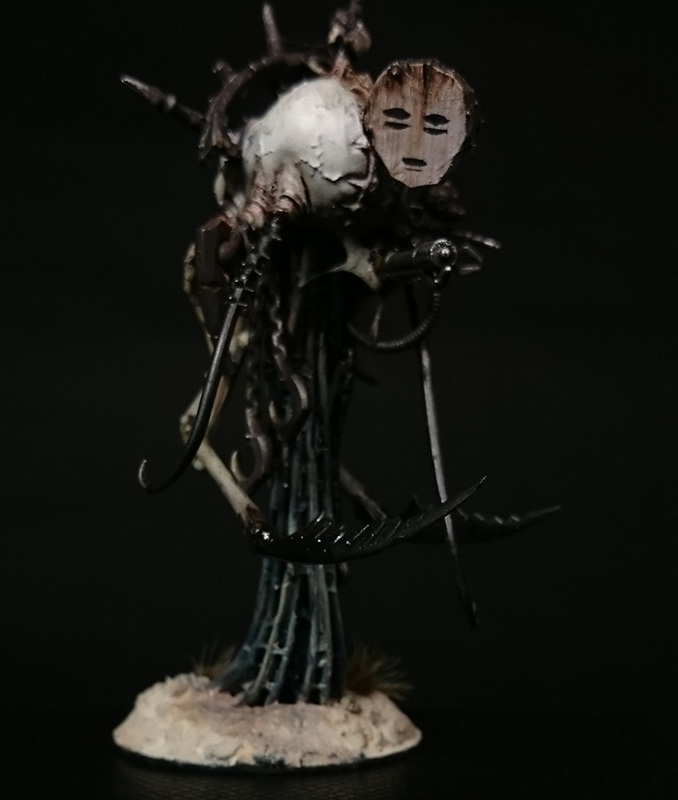 The heretek genetors of House Sinekai require specialised servitors to maintain their nightmare menagerie. Geist servitors drift patiently around the animal pens, providing nutrients, extracting specimens and performing simple surgeries. The geists are also used in times of war, drifting ominously and implacably towards their target. Their parasitic bio-electic tendrils drag along the ground and drawn in nearby sources of energy allowing the geists to remain functional indefinitely, though requiring them to remain motionless and recharge after large energy expenditures. Their equipment – electro whips, surgical manipulators and assorted mechandrites – are often supplemented by flamers and tezlic lightning cannons. Though largely mindless, geists are capable of performing relatively complicated tasks. They posses simple sensor clusters which are often hidden behind masks – often little more than a crude drawing. Love the text hidden in the comments box Jake! But I love the Servitors more, looking forward to seeing rest of House Sinekai soon. Such a great idea and nicely executed. The blue details contrasts very nicely with Robert’s red glow. Huzzaah! Amazing stuff, Mr. Bruticus! P.S. Peter told me about your blog and I’m glad that he did so. The one Geist’s mask reminds me of the one spirit from the animated film, Spirited Away. Was it by chance influenced by that? I guess perhaps that is also just a common Japanese mask design. The other’s mask reminds me of the 3rd Angel from the animated series Evangelion. Sachiel. Regardless of where the inspiration came from, these are superb. They are subtle nods, but ones that fit very well with the imagery you are going for. Sachiel was always one of my favorite Angel designs in Evangelion. I loved how after taking its first beating (to an N2 mine, I think), it started to regenerate its face. 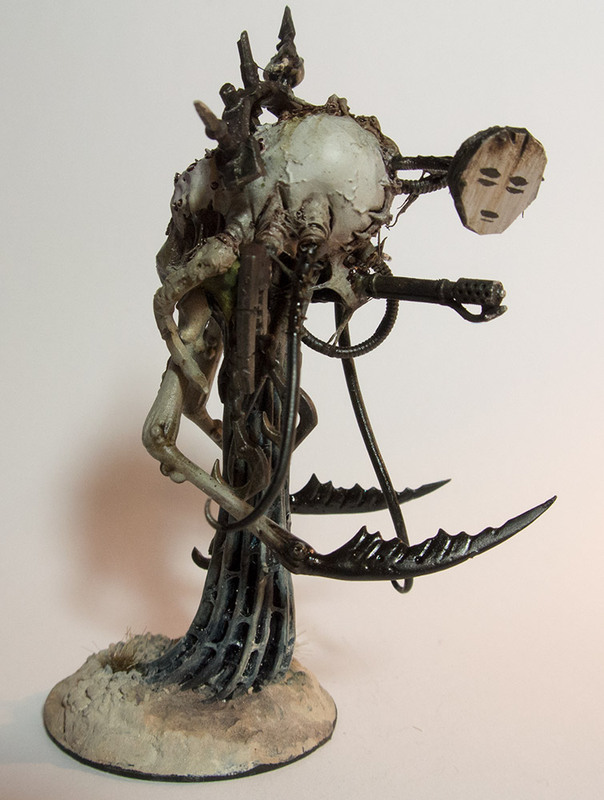 That notion seems to have been captured in one of Rob’s models, the Tekslav Shock Mutant (or that is what it reminded me of). It is fun looking at all the small and thoughtful details on all of the models on your website.